Sleeves: 3/4 flared Fitted: Designed for 2 to 3 inches of ease between body and garment. Measures 2" - 3" larger than the fit-critical body measurement. Slightly more relaxed than a close fit, still outlines figure but not tightly. I got the burgundy/wine floral. This is gorgeous. 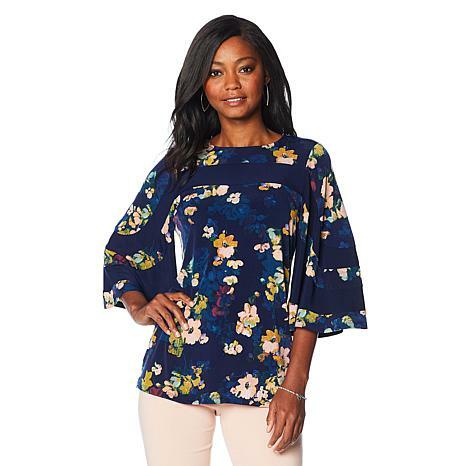 I have gotten 6 tops of hers now, 2 in 2 colors and i love them all! Amazing fabric, fit and quality. Tunic length is my favorite. Can't wait for more of this line! I really like this top!!! The material is not flimsy. It has some weight to it, but not too heavy. I also like the colors in it. The size medium was just the right size for me. I have the blue and pink shirt!!! Totally comfortable... a shirt style which will last forever. Missed out on the black &white:(. Please make some more black and white shirts!!! Beautiful..great fit..can dress up or down...love this top. I have several NL items. The quality of the fabric is amazing and washes great. I never review until after I have warn and laundered and her clothes truly hold up. Quality merchandise for a good cost.